This created a problem for colonists because there were no gold or silver mines in the New World and approved currency (silver and gold coins) could only come from proper trade as regulated by Mother Britain. And since the Crown restricted trade with Dutch, French and Spanish colonies in the West Indies, that meant the only means by which the colonies could obtain approved currency was with Great Britain, herself. In other words, the Currency Act plunged the American colonies into a great, big ol’ depression. Franklin knew that choking the barely burgeoning economies of the young colonies would not only prove detrimental to the growth and future success of said colonies, but would ultimately backfire through inevitable rebellions. And that’s exactly what happened. The Currency Act, even more than the Sugar Act, started to really turn up the heat in the years ahead of the American Revolution. 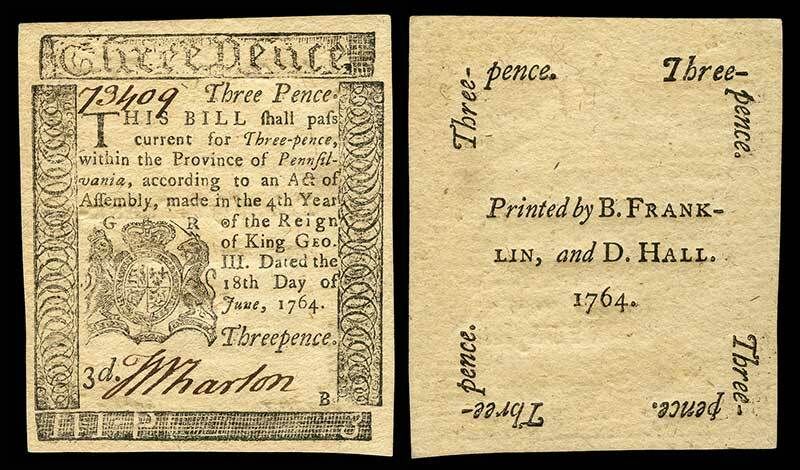 The Currency Act of 1764 made the Colonial Script that Franklin had referred to in the earlier statement illegal. One might think that after the American Revolution, this new nation would be able to avoid the types of money troubles the colonists had under the Currency Act, but it seems we never learn. After the Revolutionary War, the fledgling United States government was up to its eyeballs in debt. That is when talk began about establishing the First Bank of the United States, which was a predecessor to the modern day Federal Reserve. While Alexander Hamilton was the First Bank of the United States’ greatest champion, Thomas Jefferson and James Madison were deeply opposed to such an institution. They believed that a central bank was unconstitutional, and that it would create an unfavorable balance relating to currency that, in this case, favored merchants and investors, at the expense of ordinary colonists, just as the Currency Act had created a detrimental imbalance in trade between the colonies and Great Britain. Previous Post: « The Sugar Act (1764) – Why did a law that reduced an earlier tax end up outraging colonists?